A small-batch product created to add flavour, texture, and whole plant nutrition to your daily meals! Offering Heart-Healthy Fats, Protein, Fiber, and Essential Vitamins & Minerals! Top S&S on Salads, Soups, Sautéed greens, Toast, Noodles, Roasted Veggies, Smoothie Bowls, Ice-cream etc. Easy to integrate into our daily meals - this Super Seed Topper boost the nutritional value of our way in a simple and delicious way! To us, seeds represent potential, growth, and wholeness. As the source of all plant life, seeds are naturally nutrient-dense - rich in satiating heart-healthy fats (including Omega 3&6’s), protein, fiber, essential vitamins and minerals (like iron & calcium). Jazz up all of your meals with this hella tasty Super Seed Topper! 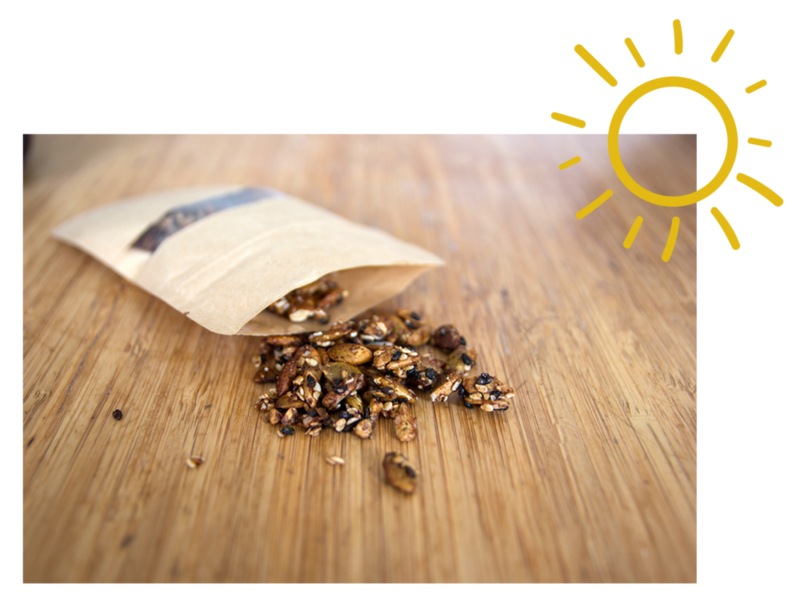 S&S is composed of 5 whole seeds: Pumpkin seeds, sunflower seeds, buckwheat groats, black and white sesame seeds, and hemp seeds. Flavoured with pure maple syrup, organic gmo-free soy sauce, and a special blend of aromatic spices. No refined sugars or processed oils added. Seeds may be small in size - but they are big in nutrition. Spice & Seed is made with 5 whole seeds - that provide heart-healthy fats (including Omega 3&6 from hemp! ), protein, fiber, essential vitamins & minerals. Supporting the nutritional completeness of our vegetable or fruit-based meals. Seeds may be small in size, but they are big in nutrition! While this topper is tasty enough to eat as a snack, it was designed to be enjoyed in servings of 3-tablespoons. Enough to add flavour, texture, plus a boost of nutrition to your daily dishes! Our special blend of savoury spices, are used to season each hand-toasted seed. While spices naturally offer plenty of flavour - they also provide anti-inflammatory benefits - supporting immunity! STAY CHILL & KEEP OUR TOPPER in the fridge! While we typically store seeds in the pantry, they actually stay fresher & crunchier for longer when refrigerated - protecting their delicate fats. Also, seeing as we use maple syrup instead of refined sugar (aka a preservative) - it is best to pop S&S in the fridge, for your long-lasting enjoyment! All the flowers of tomorrow are in the seeds of today. In dreams, we plant the seeds of our future.